"Melting glaciers, rising sea levels, fires, floods and droughts. On the eve of a historic election, award-winning producer and correspondent Martin Smith investigates how the world's largest corporations and governments are responding to Earth's looming environmental disaster. 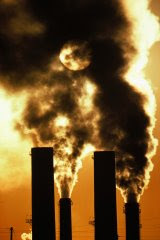 The world needs to dramatically cut the carbon emissions responsible for wreaking havoc on the planet's climate, according to Dr. Rajendra Pachauri, whose organization, the Intergovernmental Panel on Climate Change (IPCC), shared last year's Nobel Peace Prize. "If we don't take action immediately, we face a crisis," Pachauri tells Smith. "Climate change is caused by human actions, and we need to do something about it. The sooner we realize that, the better." With that sense of urgency in mind, Smith traveled to 12 countries on four continents to investigate whether major corporations and governments are up to the challenge. HEAT features in-depth interviews with top policy-makers and with leading executives from many of the largest carbon emitters from around the world, including Chinese coal companies, Indian SUV makers and American oil giants. The report paints an ominous portrait. Despite increasing talk about "going green," across the planet, environmental concerns are still taking a back seat to shorter-term economic interests."